Electronic cigarettes, also known as e-cigarettes, are battery-operated products designed to deliver nicotine, flavor, and other chemicals. They turn chemicals, including highly addictive nicotine, into an aerosol that is inhaled by the user. Vaping is the act of using an electronic cigarette, which can resemble the act of smoking a cigarette. How much nicotine does an e-cigarette contain? A typical e-cigarette chamber can hold up to 3 milliliters (mL) of liquid nicotine. Nicotine concentration in common products can range from 6 mg per mL all the way up to 24 mg per mL. This means one e-cigarette can contain anywhere from 18 to 72 mg of nicotine. In comparison, one cigarette can contain 8—20 mg of nicotine. 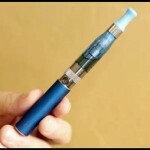 Are electronic cigarettes safer than traditional cigarettes? Can pregnant or breastfeeding women use e-cigarettes? No. There is no safe level of nicotine for pregnant or breastfeeding women. Nicotine can cross the placenta in the mother’s womb and can cross over to the baby through breast milk. Babies exposed to nicotine can have problems with feeding and may have delayed mental and physical development. How can I keep my child safe from liquid nicotine? It is important to store all nicotine products out of reach of children. Children may be attracted to liquid nicotine products because they come in brightly colored packages, are flavored, and are not required to have child resistant packaging. Parents also should not use e-cigarette products around young children as young kids may be tempted to mimic the actions of older adults. It is illegal to sell e-cigarettes to anyone under 18 years of age in Washington.